Friends and family of the 43 disappeared students from Iguala, Guerrero, demand answers from the government. Photo: Animal Político. 02/05/15 (written by cissel) — Mexico recorded more cases of disappearances and missing persons in the year 2014 than any other year on record in Mexican history, according to statistics released in November 2014 by the National Registry of Missing or Disappeared Persons (Registro Nacional de Personas Extraviadas o Desaparecidas). According to Animal Politico, in the first ten months of the year, Mexico recorded 4,836 cases of people who could “not be found’ (“no localizadas”). 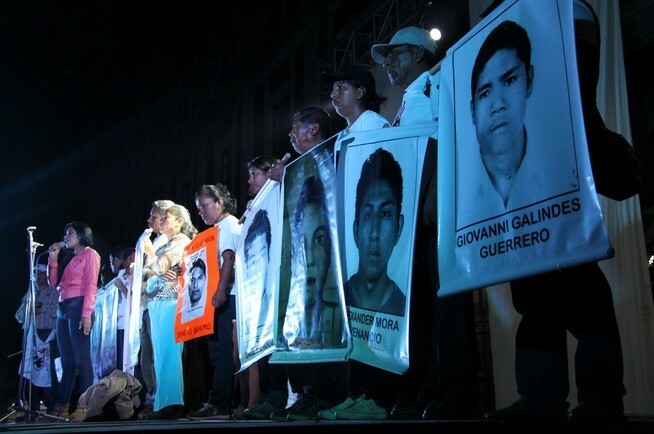 From 2007 through October 2014, Mexico had seen the disappearance of 22,610 people, plus another 995 recorded cases prior to 2007, which brought the total number of missing or disappeared persons in the country to 23,605. 40% of these cases were recorded during the Peña Nieto administration, which began in December 2012. On a state-by-state basis, the most people reported disappeared between 2007 and October 2014 were in Tamaulipas, which registered 5,380 such victims through October 2014, 30% of which have been recorded under the Peña Nieto administration. Jalisco had the second most cases with 2,150 during that time frame, with 49% of which were under the Peña Nieto administration. The State of México (Estado de México, Edomex) recorded the third most with 1,745, 52% of which came during the current administration. Coahuila, Sinaloa, Chihuahua, Baja California, Nuevo León, Guanajuato, and Michoacán rounded out the remaining top ten states, respectively. Bringing it into 2015, according to the most recent official data released on disappearances, which was reported by the Attorney General’s Office (Procuraduría General de la República, PGR) on January 19 of this year, the number of disappeared has increased to 23,271 since its October numbers. The PGR’s Search Unit is actively searching for 621 of those, just 2.7%. The same day the new numbers were released, however, “a legislative press release…said the new registry of the missing dates back to 2003,” writes the Associated Press. As previously reported by Justice in Mexico, when it comes to disappearances, the Peña Nieto administration has struggled to deliver a cohesive message. 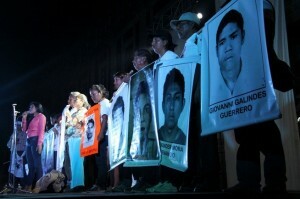 The data reported above was revised by the government several times: In August, Mexico’s Interior Ministry (Secretaría de Gobernación, SEGOB) released conflicting data on the number of disappeared persons (desaparecidos) in Mexico, reporting that there were 22,322 missing persons, of which 12,532 occurred under the Calderón administration (2006-2012) and more than 9,500 under the Peña Nieto administration (2012-present). This was an increase in the number reported by Interior Minister Miguel Ángel Osorio Chong in June when SEGOB confirmed that there were 16,000 missing, data which he clarified after releasing confusing reports in May saying there 8,000 disappearances. After President Felipe Calderón left office in 2012, the database was just over 26,000, though Mexico’s Attorney General’s Office increased that number to 29,707. With SEGOB’s clarification, the combined lists of disappearances under the Calderón and Peña Nieto administrations stood at over 22,610 as of October, as reported WOLA citing the Mexican government’s National Registry of Missing and Disappeared Persons. However, it has since risen to over 23,000. Martínez, Paris. “2014, el año con más casos de desapariciones en México: van 5 mil 98 víctimas.” Animal Politico. November 19, 2014. “2014, el año con más casos de desaparecidos en la historia, revela studio.” El Constituyente. November 19, 2014. Justice in Mexico. “December 2014 News Monitor.” Justice in Mexico. December 2014. Associated Press. “Mexico Has ‘Serious Problem’ With Disappearances.” Al Jazeera America. February 2, 2015. Redacción. “México, incapaz de decir a la ONU cifra de desaparecidos; la CNDH reconoce crisis.” Sin Embargo. February 2, 2015. This entry was posted in Human Rights and Civil Society. Bookmark the permalink. Subscribe to our newsletter and join other 2,617 Justice in Mexico readers!